Aklan’s capital Kalibo is an awesome destination in itself and not just a jump-off point to Boracay. For many people, the idea of exploring this town’s off-the-beaten-track attractions—which include white sand beaches, waterfalls and mangrove parks—might be more interesting than squeezing into crowded beaches and pricey hotels along with hordes of other tourists. The trip to Kalibo, sponsored by the Department of Tourism, is a fascinating discovery of the town’s well-preserved natural treasures and its cultural and historical heritage. The distinctly cool weather and laid-back culture came as a surprise, since the town is seen as one of the business hubs of the Western Visayas region and an international gateway. Ati-atihan. Kalibo’s most famous attraction brings thousands of local and foreign tourists to the town every third week of January. One of the country’s grandest and oldest festivals, the Ati-atihan feature costumed soot-faced performers taking to the streets to dance to drumbeats in honor of the Santo Niño. The Aklan Freedom Shrine. At the town center is the Aklan Freedom Shrine, at the center of which a monument to the heroism of Aklanon revolutionaries who joined the Katipunan during the Spanish occupation. 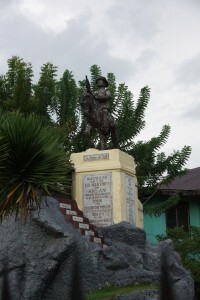 The 19 Steps monument contains the mortal remains of the 19 Martyrs of Aklan and the effigy of their leader Francisco Del Castillo. The Lagatik River Cruise. The Lagatik river cruise in New Washington town lets visitors enjoy a sumptuous lunch of the town’s best seafood and fresh tropical fruits for only P500 per person while cruising the serene river fringed by lush mangroves. For those who love to sing, you can hit that perfect pitch as the ship has a videoke on board. The town of New Washington is also the birthplace of the well-loved Jaime Cardinal Sin. In honor of the late Manila archbishop, the townfolk have established a shrine at the town center near his ancestral house. Jawili Falls. Memorable trips are made with spontaneous decisions. The crystal-clear waters of Jawili Falls in Tangalan town never fail to entice passersby to take a quick dip, even those who come there with no plans to swim. Foreign and local tourists who take side tours around Kalibo often drop by here to scale the seven towering cascades. There are now small amenities such as shower rooms, cottages and a small restaurant in the area. Visitors do not need to hike to get there as the first basin is accessible from the main road. The entrance fee is only P10. Bakhawan Eco-Park. Kalibo is also a haven of eco-tourism. 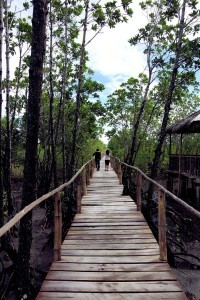 A must-visit in Kalibo is the idyllic Bakhawan Eco-Park in New Buswang. 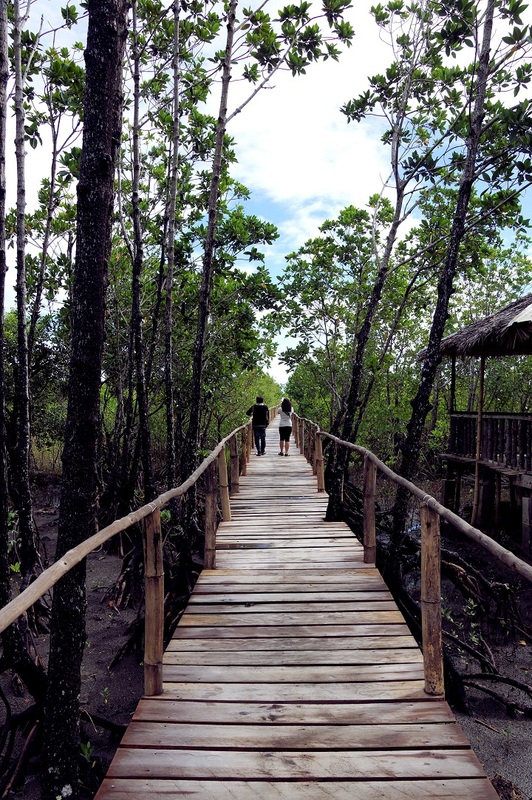 The 170-hectare mangrove reforestation area was built in the 1990s to address the frequent flooding in the town and aims to protect and maintain the rich ecosystem of Kalibo. Take a relaxing walk around the eco-park, crossing man-made bamboo bridges to reach the picture-perfect scenery of a tranquil river with a lush mangrove forest as backdrop. There is a small colorful boat tied at the end of the footbridge, as if waiting for travelers who want to further explore nature’s beauty. 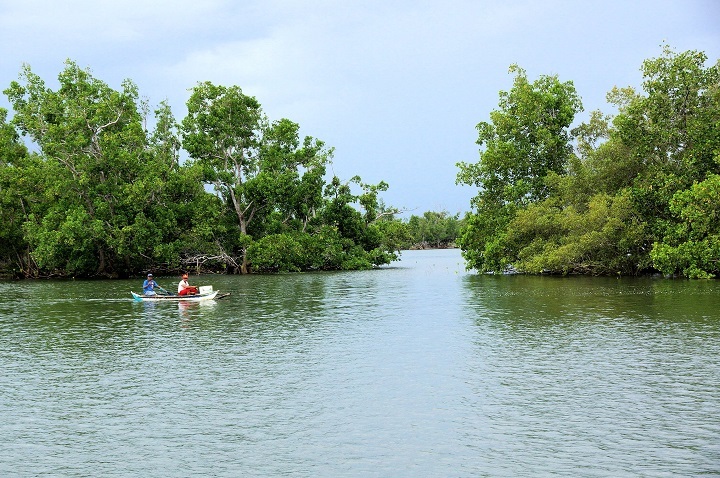 Be sure to reach the end of the path of the lush forest mangrove to get the fascinating view of the sea. The serenity that this place brings is more than enough to stay in this town. The Bakhawan ecopark can be reached in 20 minutes by tricycle or private vehicle from the town proper. Entrance to the ecopark costs P100 per adult while students pay only P50 (effective November 2014). Piña silk. Aklanons are also known to have pioneered the 8th century tradition of pineapple fiber weaving. Piña silk has been a popular choice offabric for the Philippine elite since the Spanish era. The fabric is usually used for making formal clothes such as the barong Tagalog and the terno; home accessories, and personal items like handkerchiefs. The piña-weaving industry is an important source of livelihood for many Aklanons. If you want to check out some of the weaving, visit the La Herminia Arts and Crafts and the Dela Cruz House of Piña.